Ideas for devotionals can come from any incident, person, situation, comment, example, anecdote, quote, statistic, fact, mannerism, activity, happening … anything that grabs your attention. “Ideas are all around you.” I heard that statement a lot when I first started writing. It both encouraged me and intimidated me. It encouraged me because it was comforting. If ideas are all around everyone, that means ideas are all around me, too. But I was intimidated. Just because ideas were all around me did not mean that I could capture them. All kinds of words, images, and conversations are fluttering around in the air. 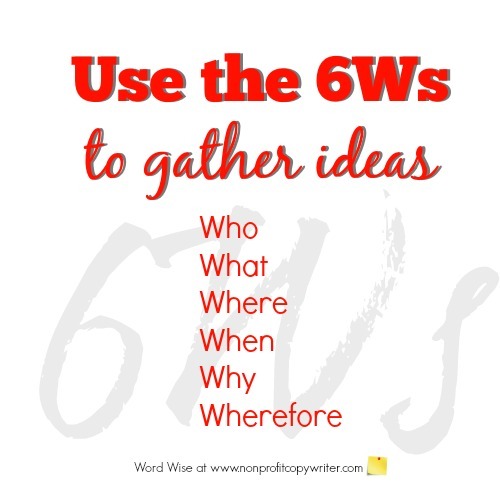 You can capture them and make them understandable when you use a simple tool: the 6Ws. This is a series of six questions that are basic to information gathering, used by journalists to researchers to law enforcement officials to elementary school students. And by devotional writers, too. Sometimes the 6Ws are referred to as 5Ws and an H because the last of the six can begin with an H rather than a W.
Wherefore did it happen? … or How did it happen? Make a conscious decision to use the 6Ws throughout your day. You have a better chance of seeing what God wants to show you when you regularly ask questions and gather information from the answers. Once you decide to be intentional, you’ll start to notice things you didn’t notice before. Here are some places to look to get started. Where do you find ideas? Tell us in the Comments section below.